Struggling with unbearable shoulder pain, Michael Pizza was on his quest for the best shoulder surgery to handle his pain. 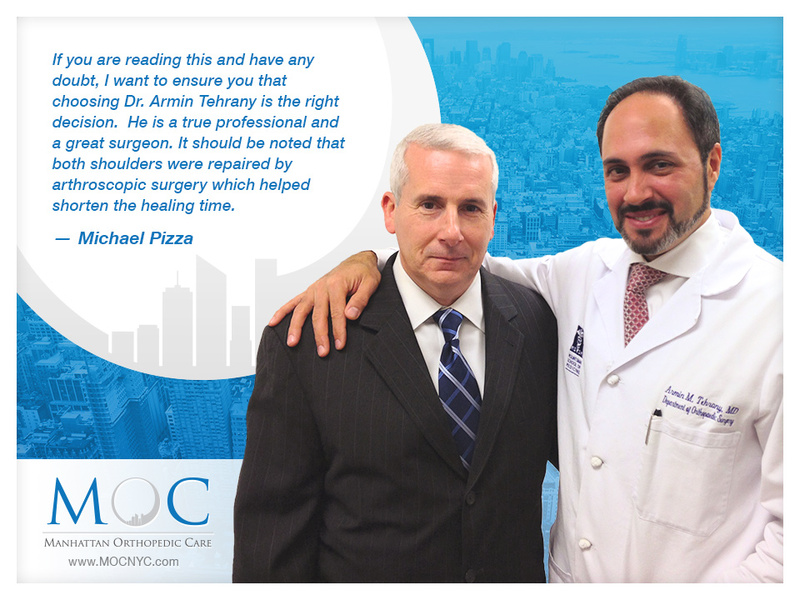 It was only matter of minutes before Mr. Pizza knew and felt sure that Dr. Armin Tehrany was the shoulder surgeon he was looking for. As he stated in his Yelp review “I found nothing but praise for Dr. Tehrany’s work”, which only made him more confident with his decision. “I had an accident at home in 2013 on Memorial Day where I injured both my shoulders. I found Dr. Tehrany through the internet and visited him on Tuesday. After my first visit I immediately felt comfortable but did take the time to look into his practice and found nothing but praise for Dr. Tehrany’s work. I felt comfortable moving forward and scheduled my shoulder surgery two weeks after my first appointment. My first surgery in June involved repairing a dislocated shoulder where I had torn all the tendons and the biceps muscle. Doctor Tehrany was able to repair all the damage on that shoulder. Everyone at Manhattan Orthopedic Care was committed to helping Michael embrace life without pain as soon as possible. They made sure he had all the care, support and friendly smiles he needed. We are more than happy to see Mr. Pizza feeling strong and fully recovered, with the freedom to easily do a whole range of motions. “It has now been over nine months since my first shoulder surgery and four months since my second surgery and I am happy to say that I have full movement in both my shoulders. I truly feel that if it was not for Dr. Tehrany’s expertise I would not have healed to the extent I have today. If you are reading this write-up and have any doubt I want to ensure you that choosing Dr. Tehrany is the right decision. He is a true professional and a great surgeon. His office is also very professional, helpful and a pleasure to deal with.